What a perfect book to read for this month. We had a costume shop that would be fun to stop by and check out, Halloween and oh a murder. It would seem there should be more than one suspect in this case as who would want their historic downtown turned into box stores but Margo had a big fight with the victim so the finger is pointed at her. The more she "digs" into Haverford's life the more people she find that would have wanted hime gone. 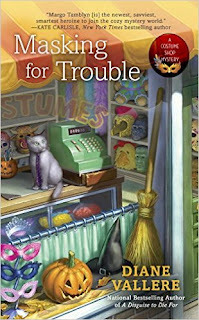 One little fun thing in this book is seeing all the different costumes that the kids that are helping out at the store come up with. The things that Margo does and the things she gets herself into while trying to solve this mystery will leave you shaking your head. I think it is a good mystery when the identity of the real killer is kept until the end and that is what this author has done. This was a good addition to this series and I look forward to more by this author. What a perfect book to read in October!